The work of Dr Hey – father of Radio Astronomy. In 1966 the Radar Meteorological section at RRE, which was funded by the Met Office, was added to Dr Hey’s group. However before this, previous work using the radar in the Giant Wurzberg at Malvern had resulted in the ability to see rain clouds at long range. One of the interferometer dishes at Defford was fitted with a 500MHz radar which was used to observe meteor trails. 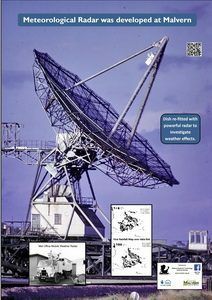 Later a high power 10 cm coherent pulsed Doppler radar was fitted and used to investigate the occurrence of clear-air turbulence which posed a threat to high flying aircraft. This work was continued at North site using the large troposphere dish. They concluded that at the time it was possible to detect clear air turbulence but the technology was not sufficiently advanced to be able to fit such a radar to an aircraft. This is still not possible but techniques using lasers are being investigated. 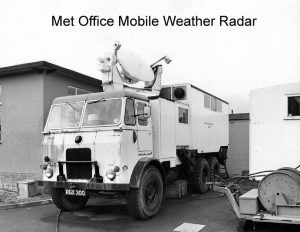 The Met office also had mobile radar based at North Site which was used to detect thunderstorms. 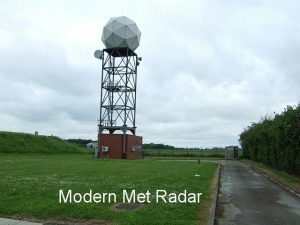 During the 1970’s this work by RRE and the Met Office at Defford led to the first transmission of rainfall weather over a data link and was the beginning of the current comprehensive UK weather radar system, which provide real time wind and rainfall measurements used for accurate weather forecasting.